H♥me is where your heart is and we are in love with this stylish, simple bracelet! Creat a personalized bracelet stamped with the location of your home and family. The inside will have one simple word, H♥ME. In addition, a simple bronze heart can be added as a special extra touch of love. 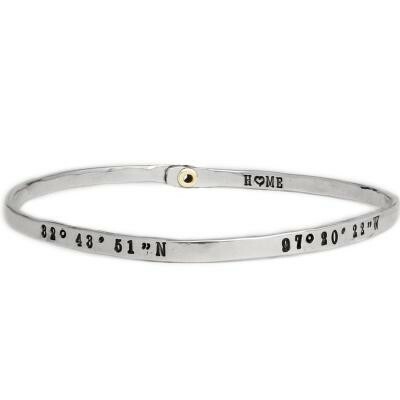 H♥me is where your heart is and we are in love with this stylish, simple bracelet that holds so much of what is meaningful to you - the location of your home and family. We will stamp the coordinates of your address on the outside and on the inside will be stamped with the word H♥ME. In addition, a simple bronze heart can be added as a special extra touch of love. In the dropdown, just type in the address and we will look up the coordinates! We can stamp the coordinates of whatever address you want on the outside. It can be a home address, a school, a college dorm, or just a special spot that holds meaning to you. The coordinates will be formatted as this example: 32G·n42'06"N 43G·n04'34"W and it will include about a 3/4" space in between the two stamps. On the inside we stamp H♥ME unless you tell us in the comments section you want something else. Max characters for inside stamp is 9. Bangle is approx 3mm wide. All silver is sterling and rivets are brass. This bangle bracelet and does not have a clasp, it slides over your hand and onto your wrist. We are unable to change the size of the bangles once they are ordered so please be sure to order the correct size. We STRONGLY suggest that you view the video below (in the tab below) and print out the bracelet sizing guide to help you determine your size. Please make sure you print the page at 100% (do not scale page or the measurement will be incorrect). Love my bracelet and the meaning behind it. I had to contact customer service about questions on sizing and they were SO very helpful!! Good customer service is a selling point for me! What a beautiful bracelet! Wonderful idea. Well made with great detail. Itâ€™s just a bit smaller/thinner than I was expecting. Iâ€™m sure it will be loved.